The world is urbanizing on a rapid scale: in 2014, the global urban population was almost 3.9 billion, and it’s expected to reach 6.3 billion by 2050. This trend is especially pronounced in India, where the World Bank estimated that up to 55% of people lived in urban settings in 2010, far more than the official rate of 31%. While many of these people making the move to urban centres do so in search of jobs and better lives, millions end up living in slums, and conditions for the urban poor are going from bad to worse. Today, one in six urban citizens in India live below the poverty line. 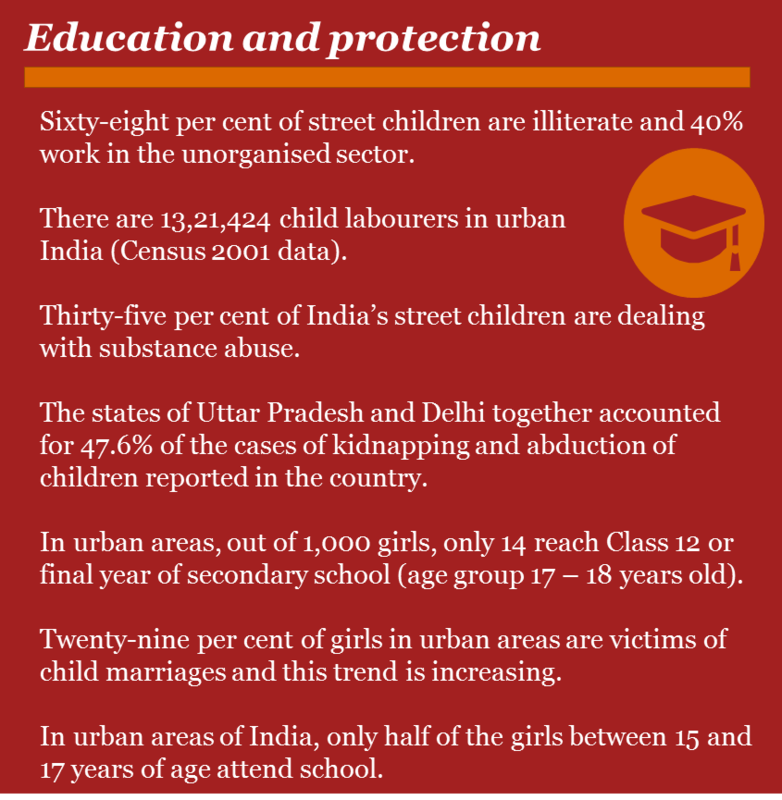 A 2015 report from PwC and Save the Children uncovered some of the conditions India’s urban poor are living in. The challenges they face are enormous. Every city in the world is having to tackle the issue of rising property prices and how this affects the urban poor. But in some Indian cities, the situation is becoming desperate. 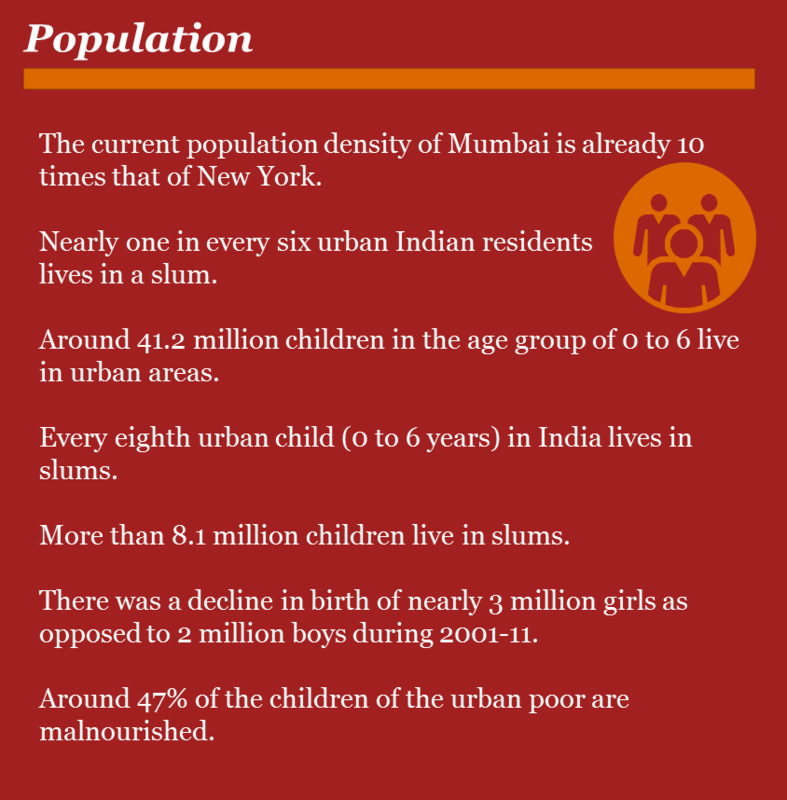 In Mumbai, for example, over 50% of the population live in informal settlements. As a result, they have little or no access to basic services: water, sanitation, power and waste management. For example, only 71.2% of urban households have access to clean drinking water in their house and one in five urban households do not have their own toilet, and instead depend on shared facilities. This also explains why India accounts for nearly half of the global population defecating in the open. Some of the most badly affected by these constraints are the young people growing up in these urban slums. Approximately 443 million school days are lost as a result of water and sanitation related diseases. As a result of this and the already low school enrollment rates, 68% of street children are illiterate. But the problems affect more than just the young. Around 85% of India is vulnerable to disasters, and cities such as Kolkata, Mumbai and Delhi are facing serious threats related to climate change. Unfortunately, while the threat is real, disaster preparedness in India leaves a lot to be desired, both at the policy level as well as in terms of implementation. A major disaster can have serious implications for the urban poor, who are the most vulnerable members of society. The Indian government is all too aware of this situation, and is starting to do something about it. Working with international experts, they have set out a vision to build 100 smart cities. Government of India launched Smart Cities Mission to identify and roll out smart cities in order to drive economic growth, strengthen governance as well as enhance the quality of life for people. The upcoming smart cities will harness technology to enable local development and improve the social, physical and economic infrastructure of cities. To kick-start the transformation of cities, India Smart Cities Challenge was launched to shortlist 20 cities that will receive funding from the central government for upgrading to smart. Apart from this, the government is partnering with countries such as France, Germany, Spain and Singapore to make leverage their expertise for making Indian cities smart. Other schemes such as Atal Mission for Urban Rejuvenation and Transformation (AMRUT) and Housing for All have been drafted in a way that gives due consideration to the needs of society’s most vulnerable. AMRUT scheme intends to rejuvenate cities by improving the green cover and open spaces, as well as assuring water supply and sewerage connection in each household. Also, the scheme will mitigate pollution by encouraging people to switch to public transport and construct facilities for non-motorized transport such as cycling and walking. Housing for All or Pradhan Mantri Awas Yojana scheme was launched with the sole purpose of providing a roof on each head by the year 2022. The magnanimous scheme will specifically target women, economically weaker sections of society as well as scheduled tribes and casts. As part of the scheme, over two crore houses will be constructed all over India to addressing the house needs of vulnerable sections of the society. The two schemes are designed to uplift the urban poor and improve their standard of living by taking care of their fundamental needs. While the government has taken big strides in improving the lives of the urban poor, the private sector must also start contributing. If companies can place equally important value on profit, planet and people, they could be change enablers. It makes good business sense. After all, some of India’s most vulnerable people also happen to be one of the biggest market segments. f this is to happen, the government will also have to create an enabling environment, where businesses are incentivized to invest in urban infrastructure and services. After all, a nation can truly progress if all the stakeholders, including government, businesses and citizens, join hands to collectively work for the betterment of society at large. Ambitious schemes such as Smart Cities, AMRUT and Housing for All are colossal steps for the betterment of citizens, especially the urban poor. I strongly believe that once primary needs of bottom of the pyramid are taken care of they will be empowered to contribute significantly to the country’s economic progress. Our report, Reforms to Accelerate the Development of India’s Smart Cities, is available here.